The Kislers and their crew maintain an orchard of more than 3,000 trees, but they also depend on neighbors strewn throughout the Quimper Peninsula - a temperate coastal area crowded with orchards - who donate many of the apples they use. Visitors are able to participate, too: guests who come to stay a night or two at Finnriver and who don't object to getting some of the Beaver Valley's rich nitrogenous soil under their nails can help out on the farm. >Cider making is a burgeoning and innovative industry, but it is also a venerable American craft with a long and durable history. The early colonists, ever thirsty but with scant access to the stout grain whiskeys they had known in Europe, enthusiastically exploited the New World's nectarous and abundant fruit orchards, and soon hard ciders were being served alongside an array of beers in taverns and roadhouses up and down the Atlantic seaboard. The upper crust glutted themselves on brandies, but ordinary folks drank sweet rum, ales, and cider. Cider is wine. The process of making it is similar to that used to produce a luscious Bordeaux, but there are important differences. To begin with, don't look for peasants stomping around in tubs. 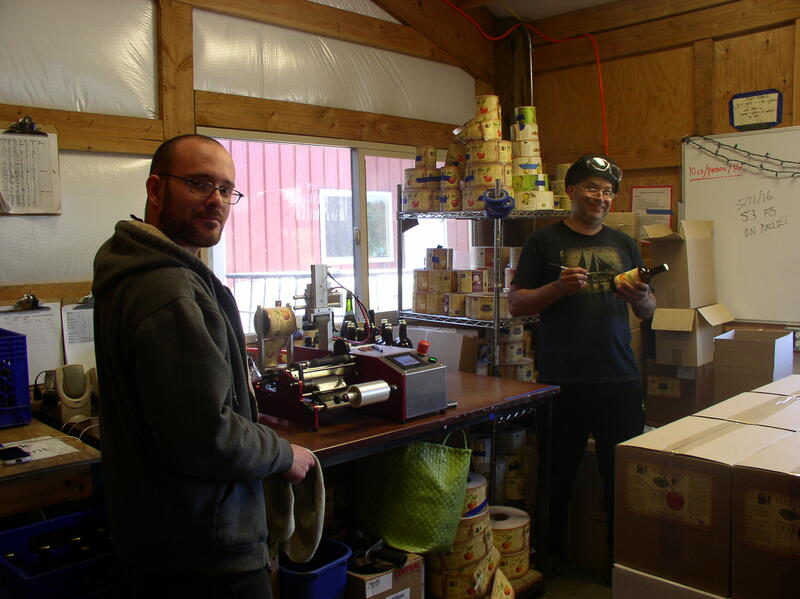 Finnriver used a simple squeeze box to maciate their apples, after they are carefully selected, washed, and sent through a grinder. On average it takes about fourteen pounds of apples to give a gallon of cider. 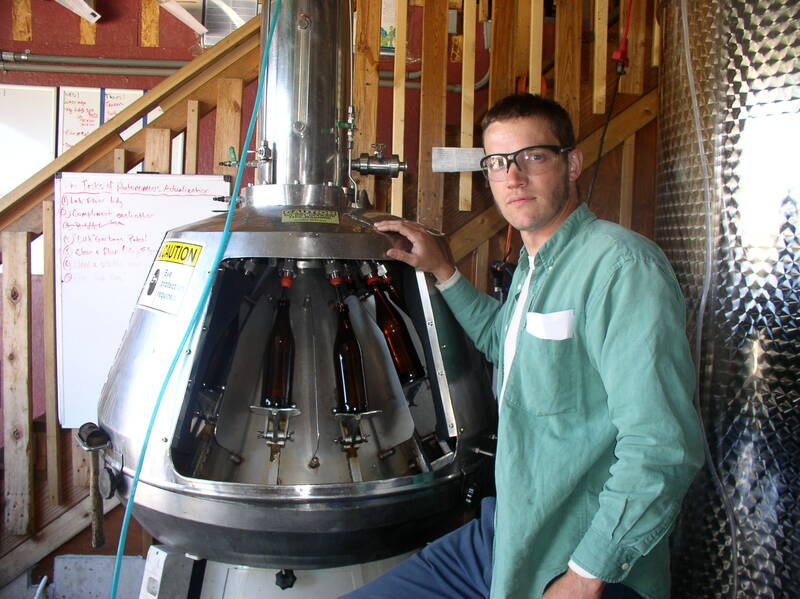 Eric Jorgensen, a former elementary schoolteacher who partners with the Kislers - he serves as the cidery's chief financial officer - has the responsibility for overseeing the manufacturing operation. Eric is particularly fond of the high-acid juice available from Granny Smiths and Pink Ladys, but they experiment from time to time with different varieties and like to invent new blends. "From the beginning we've been at or near the frontier of experimentation with new styles of cider, while working to stay rooted in traditional methodology," is how Eric explains it. Fermentation is a microbiotic process. At a commercial winery like Finnriver, sugar and yeast - usually Belgian ale yeast, or champagne yeast - are used to incite fermentation. Fermentation converts the natural sugar (glucose) of fruit juice into alcohol. Finnriver's ciders commonly finish at around 6.5% alcohol, though a few are fortified as high as 18�%. It's a natural process that results from the rotting of fruit juice, and it seems simple enough, but the chemistry is surprisingly complex, and in order get something that is salubrious as well as palatable, you need to know what you're doing. The process takes a few weeks to complete, from juicing the apples to bottling. Andrew Byers, a graduate of the celebrated Cordon Bleu culinary school and former moonshiner; is in charge of managing the process. Andrew calls himself cidermaker, production manager, or 'Duke of Tanks," depending on which task he's involved in at the moment. The tanks Andrew is talking about are the 2,000-gallon stainless steel Bright tanks where the freshly squeezed juice is stored. Frozen yeast is the catalyst that gets it all going; organic cane syrup is the sugar agent that creates the carbon dioxide for carbonation. 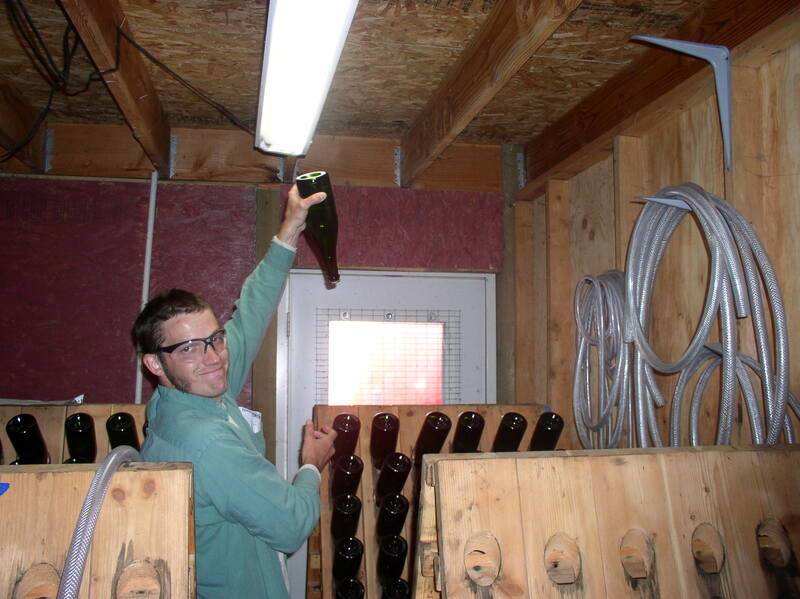 Most of Finnriver's ciders are sparkling beverages, like champagne. Finnriver sometimes enhances carbonation by pumping CO2 directly into the fermentation tanks or in some cases, adding sugar. This secondary, in-the-bottle fermentation, called method champenoise, is more complex and expensive, but it goes a long way towards giving the finished product that "stars exploding in your mouth" sensation that makes sparkling beverages so refreshing and fun to drink. Keith and Eric together took a course in cider-making in 2007. "We learned a ton, particularly as we were getting going, from some of the other cider makers around," Eric says. Particularly valuable was the help and advice they received from Drew Zimmerman, a venerable farmer and commercial cidermaker who had been quenching peninsula thirsts for years. When Zimmerman retired, they bought his apple trees and transplanted them at Finnriver. As with home-brewed beer and exotic champagnes, it is critical to add just the right amount of sugar: too much can generate excessive pressure and the bottles might explode. Eric uses a mathematical formula to carefully measure the amount of sugar needed to generate carbonation while avoiding detonation. And just to be on the safe side, Finnriver uses sturdy champagne bottles specially manufactured to withstand high pressure. "I worked out the math long ago and honestly have forgotten it all now - we just follow the recipe we came up with way back then," Eric says. The rate of fermentation develops unevenly, and depends on many subtle influences - the type of yeast used, the amount of glucose, and most important, temperature - and continues for at least three weeks, usually longer. Temperature has an unmistakable effect on fermentation. The Olympic Peninsula's oceanic weather is characterized by changeable, often overcast skies, with mild summers fed by cool ocean currents and temperate, cloudy winters. This part of the Pacific Northwest is less rainy than most people suppose (Lousiana and Houston receive more precipitation), and summers are generally fair and warm, with a narrow temperature range that only occasionally reaches into the low 80s. But climate here also has many characteristics of the Mediterranean, with moderate temperatures and dry hot summers caused by subtropical high pressure systems. Finnriver tries to maintain tank temperatures at less than 70O F thoughout the summer; this helps to retard the fermentation process and preserve the best flavor profiles. But sometimes, as the waning October brings cooler, wetter days, they introduce space heaters beneath the tanks to encourage steady temperatures and maintain a steady rate of fermentation. Finnriver workers constantly keep an eye on the thermometer; sometimes, in the middle of a unexpected hot day, the space heaters are shut off to allow the wurst to cool down. A common annoyance is the clouding caused by yeast that has settled in the bottom of the bottle. Clouding has no adverse affect on taste, but Finnriver, like any serious commercial bottler, must be attentative to the appearance of is product. To ensure they end up with a clear, untainted beverage, they use a traditional technique that was developed by French champagne makers called "riddling." In riddling, bottles are stored at a 45o upside-down angle so that the yeast settles towards the cap and concentrates near the mouth of the bottle. Finnriver's riddling rack consists of a half dozen bored holes in ten rows that hold the neck of the bottle. Andrew scrawls a discrete mark on the bottom of each bottle as a reminder of which bottle contains which recipe, and over the next few weeks, he gives each bottle a little daily shake, rotates it a few degrees, and inspects it. Over the next couple of weeks, he raises the bottom of each bottle slightly, then lowers the neck a centimeter or two. This is when expertise matters: the trick is to know at what rate the bottle should be lowered, and how much. After a couple of weeks the bottles are slanted at 60o degrees; after about three weeks in this position, Andrew lays each bottle on a solution of dry ice; this creates a frozen plug of spent yeast and sediment in the bottlenecks. The next step in clearing the liquid is called disgorgement: when the caps are removed, the sudden release of pressure forces out the ice plug. Immediately each bottle is topped up with a little sugar and a pinch of sulfur dioxide to act as a preservative. A cork is then inserted and secured with a wire cage called a muselet. Finnriver avoids very sweet ciders because, as Eric explains, "We aren't big fans of that style." But innovation is central to their mission, and they age different ciders in an assortment of barrels, usually made of European oak, or sometimes rye whisky barrels from Canada, to produce a mature beverage with particular characteristics. And as a final down-home touch, for their seasonals, they sometimes infuse local ingredients like cranberries, lavender or hops - all of which are profuse on the peninsula - along with rosehips, saffron, star anise, and even, occasionally, the zing of a few peppers. The finished product is assembled right on the farm with the help of a counter pressure bottler, which consists of a revolving head of multiple spouts. The bottling line is made up of one person sterilizing the bottles, one running the bottling machine, and another operating a pneumatic capper. "It all runs like clockwork," Andrew says. "Once it's set up everyone gets into the groove." It's a hands-on operation. You will find no robots at Finnriver - not even a conveyor belt. At Finnriver, past and future come together as a synthesis, and everyone is eager to discuss the cooperative nature of their operation. They're proud to have obtained B-Lab certification, a standard that recognizes a firm's commitment to social sustainability and environmental performance standards. It's a thoroughly modern, visionary enterprise faced with the usual challenges of any commercial venture, but they're proud to have developed a business model that reminds you of simpler times, when cooperation was more important than competition. 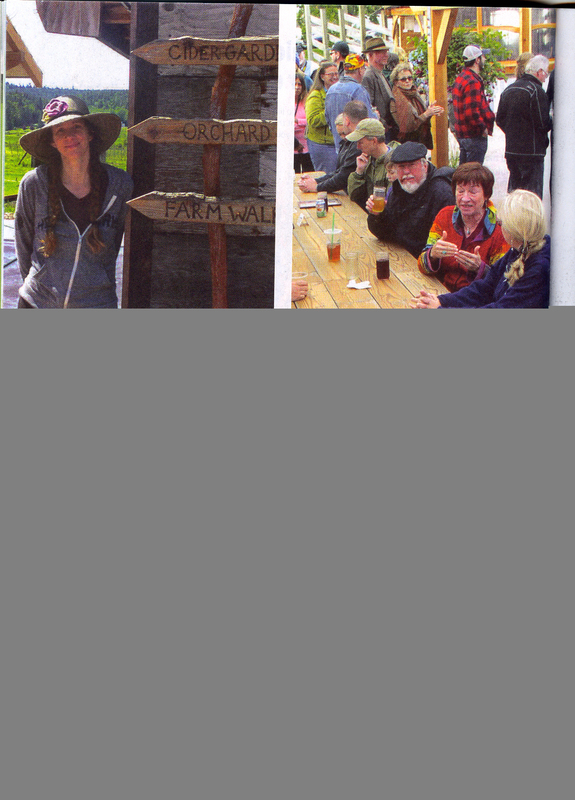 The concept of developing alternative agricultural communities is the heart of who and what they are, and is as important as the cider they make. The result is a family and community activity that is as good natured and effervescent as their product. "A primary focus of our business is to feature organically and sustainably grown ingredients," Crystie says. "We also strive to be as attentive as possible to other ecological and socio-economic details of our business. We believe in sound ecological practices that are mutually supportive rather than working against each other." And that has been proven a successful strategy. Last year Finnriver sold more than 60,000 gallons of cider (around 265,000) bottles. Their ciders have received glowing industry and consumer reviews and are available in at least two hundred groceries, markets, and coops throughout North America. They are also available on tap in an assortment of taverns. "We're making jobs that encourage people to stay in the community," Crystie says. img src="finnriver2 008.jpg" width=500 border=2 alt="Finnriver Cider carefully monitors the temperature of their ciders as they mature in storage " align=right vspace=25 hspace=25> And they're always looking ahead. In the middle of their most recent and busy summer, Finnriver completed a visionary new expansion a couple of miles north of the farm at Chimacum Corners they call Finnriver Gardens. Here, next to the old Bishop homestead, Crystie and Keith Kisler have created an inviting landscaped facility for neighbors and tourists where they can came come together to share cider, food, music, and good company. "This used to be a dying intersection," Crystie says. "But now it's evolving into a rural village." In addition to the nearly six thousand new apple trees, they have erected a tasting room, banquet hall and entertainment space - there's even an Italian bocce field. "We want it to be something like a French winery experience," Crystie says, "A place where people can stop in and sip and have a farm experience." Finnriver Gardens officially opened the last weekend of May 2016, and they invited the peninsula to come and party. Which they did. "Here," Crystie says, "They can rediscover the beauty of a fertile planet where things grow."